The following article is translated from El Internacionalista No. 5, May 2005, the Spanish-language organ of the League for the Fourth International. Over a million people march in the Mexican capital, April 24, in opposition to lifting the immunity of Federal District (Mexico City) head of government Andrés Manuel López Obrador. A week later, the government of President Vicente Fox dropped the charges against the Mexico City mayor. As the opportunist left climbs aboard the López Obrador bandwagon, the Trotskyists of the Grupo Internacionalista swim against the popular front stream, calling for a revolutionary workers party. MEXICO CITY, April 25 – The presidential electoral race has begun unusually early. Although the elections are more than a year off, in July 2006, and even though none of the three main bourgeois parties has officially decided who would be their candidate, a sharp clash at the top between various sectors of the Mexican bourgeoisie is shaping up. The most dramatic manifestation of this intense “family quarrel” is focused on the political trial which President Vicente Fox of the National Action Party (PAN) and the Institutional Revolutionary Party (PRI) have initiated lifting executive immunity from Andrés Manel López Obrador, head of government of the Federal District (Mexico City), with the clear aim of preventing him from running as the presidential candidate of the Party of the Democratic Revolution (PRD). In the battle over the desafuero (lifting official immunity), the Grupo Internacionalista warns that the threat of a future anti-democratic prohibition is being used, with considerable success, to gain sympathy and political support for López Obrador and the PRD, a bourgeois nationalist party, in the face of the heavy handed measures of the PRI and PAN seeking to keep their place in the seat of power. While defending the elementary democratic right of any political party to run in the elections with whatever candidates it chooses (even in the case of the big capitalist parties), we point out that the workers, peasants and other sectors of the exploited and oppressed must not let themselves be hoodwinked by the electoral maneuverings nor place any confidence in any side in this dispute among the bourgeoisie. In the roulette wheel of bourgeois “democracy,” it is capital that decides the outcome of the game. With the beginning of the pre-electoral period, we repeat that it is urgently necessary to break with the popular front around the PRD, which chains the workers to a sector of the ruling class. For those who seek to sweep away the present regime of poverty and repression, the key is to forge a revolutionary workers party in opposition to all the bosses’ parties. The Fox government has tried in vain to impose a series of “structural reforms” in order to comply with the demands of the imperialist financial institutions and their junior partners in the Mexican bourgeoisie. This includes selling off the energy sector to private capital (both domestic and imperialist), dismantling what remains of the pension and retirement system used by the PRI-government1 to domesticate the working class, as well as the complete elimination of the labor gains that hamper, even in a small way, the capitalists’ insatiable thirst for profits. Dissatisfied with the inability of the rancher from Guanajuato (Fox) to get the job done, the Mexican bourgeoisie is looking around for different alternatives in carrying out its starvation policies. The PRI, despite its interminable internal squabbles, has proclaimed its readiness to return to the presidency. Similarly, the PRD seeks to demonstrate to its capitalist-imperialist masters its responsibility and ability to control social discontent and keep it inside the harmless channels of the bourgeois political institutions. The current political maneuver of the Fox government and the PRI against López Obrador has the eventual purpose of preventing his name from appearing on the ballot next year. What they are seeking is that, once he is subject to trial, according to Article 111 of the Mexican Constitution, López Obrador will be denied the right to participate in the elections. But it will be months before this is concretized. At the present time, he isn’t even the candidate of the PRD (others, including the perennial PRD presidential hopeful Cuauhtémoc Cárdenas, are also vying for the nomination), and no party has presented, much less registered, its standard bearer. For now, 14 months before the elections, this is a pre-fraud being readied against a pre-candidate in a pre-electoral period which is serving as a pretext to swell support for the popular front. Should Fox and the PRI be so bold as to carry out their idiocy – imposing a ban on the politician who is, by far, the most popular of the potential candidates in the public opinion polls – then we would defend the right of López Obrader to run for president, in the framework of our efforts to debunk his candidacy and those of the other capitalist parties. For communists, the guiding principle is always to fight for the revolutionary political independence of the proletariat and all the oppressed from the politicians, parties, governments and state of their capitalist bosses and oppressors. This counterposes us all along the line to opportunist groups who, using the pretext of defending his democratic rights, have joined the cause of López Obrador and the popular front focusing on the PRD. In fact, the current struggle against lifting López Obrador’s official immunity amounts to the launching of his primary election campaign. Not only his detractors say so – “Autodestape” [Self-nomination] trumpets the front page of La Crisis (25 April) – so do his supporters. One could also draw this conclusion from the huge and very professional political marketing campaign summed up in the posters featuring a portrait of López Obrador, proclaiming “You Are Not Alone.” With 250,000 jamming into the Zócalo [Mexico City’s principal square] last August 29, some 500,000 this April 7, and more than a million in the same Constitution Plaza yesterday, López Obrador has demonstrated his “drawing power” to the political operators and kingpins of Mexican bourgeois politics: “With the March, López Obrador Makes Leap in the Election Polls, According to Deputies,” headlined La Jornada (25 April). In the name of defending democratic rights, an attempt is being made to build “the most important citizens’ political movement in the history of the Republic” – in other words, a popular front – declared the parliamentary fractions of the PRD, the PT (Labor Party) and PVEM (Greens) in the Chamber of Deputies. As for democratic rights, Marxists point out that the fuero, or official immunity, for those holding positions of executive power in a capitalist state, blocking any legal action against them so long as they are in office, is a fundamentally anti-democratic weapon. Parliamentary immunity, which prevents the arrest of legislators, is a protection inherited from feudal times which prevented the king (or president) from simply decreeing the arrest of any opponent and throwing them into the dungeons of the regime. In contrast, in the name of assuring “governability,” executive immunity protects the supreme commanders of the repressive bodies which impose the dictates of the bourgeoisie. Presidential immunity (Article 110 of the Constitution) exempted Luis Echeverría from prosecution for ordering, as Mexico’s interior minister, the Tlatelolco Massacre of 2 October 1968, in which hundreds of student demonstrators were mowed down, and for later unleashing the Corpus Christi Massacre on 10 June 1971, this time as president of the republic. His immunity continued until his six-year presidential term ended in 1976. Along with executive immunity, there are a whole series of similar measures and judicial doctrines (sovereign immunity, which protects governments from prosecution; lèse majesté, which makes it a crime to insult the head of state; and executive privilege, which permits heads of government to declare their deliberations and internal documents secret) which Marxists categorically oppose. The purpose of all these types of immunity is to provide capitalist rulers with maximum impunity so that they can make use of the measures they consider necessary in order to suppress social discontent. Nevertheless, even though lifting López Obrador’s immunity was not in and of itself an anti-democratic act, removing him as the elected head of Mexico City’s government would be an abuse that must be condemned. This is a result of Mexico’s judicial principles which, at bottom, do not presume that a defendant in innocent until proven guilty. Yet while the squalid political motives of the Mexican Congress were obvious when it removed López Obrador’s immunity on April 7, the electoral aims of his supporters are no secret either. the layoffs of Federal District employees, most recently of 29 workers, mostly women, by Locatel (a telephone service to locate missing persons), who were fired at the end of March and then persecuted by the police, which dissolved a protest meeting and arrested one of the organizers. Nor should the assault by riot police against the National University [UNAM] student strikers ordered by Cuauhtémoc Cárdenas on 4 August 1999 be forgotten, or the bloody charge by the SSP’s granaderos (paramilitary police), who viciously pounded students with riot batons and heavy shields as they were protesting outside the American Embassy on December 11 of the same year calling for freedom for Mumia Abu-Jamal, an action ordered by the chief of police of Rosario Robles. In both cases, these events took place when the PRD leaders were head of the Mexico City government. We would be happy to see them both in the defendant’s dock for this “abuse of power” and these acts of violence, but such cases will go nowhere in the bourgeois judicial system, and under Mexican doctrines of executive immunity they would be impossible. 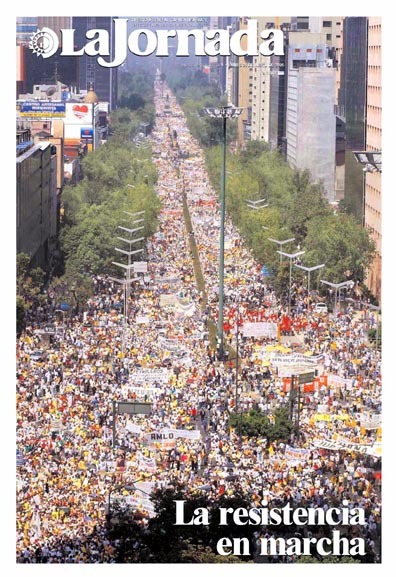 Beyond the legal particulars, the huge turnout for López Obrador’s rallies reflects a spreading sense of disillusionment due to the fact that the long-awaited defeat of the PRI in the 2000 elections did not translate into any benefit for the population. Quite the contrary, it opened the way for Fox to carry out the same privatizing policies that characterized the last PRI administrations under presidents De la Madrid, Salinas de Gortari and Zedillo. But that is no reason to draw the conclusion that some other bourgeois politician promising “democratic change” would do any better. If López Obrador is the next occupant of Los Pinos [the Mexican president’s residence], he will do the same as his predecessors. The experience of the Fox regime underlined that the fall of the PRI did not change the capitalist class interests controlling Mexico (both of the weak local bourgeoisie and its senior partners in Washington and Wall Street) that required a heavy-handed regime. They could not tolerate more than a pretense of “democracy” in Mexico, which is barely separated from the United States by the longest land border anywhere between the semi-colonial “Third World” and the imperialist “First World.” In the framework of capitalism in its epoch of imperialist decay, the working class can only expect an intensification of the bosses’ attacks, an increase in poverty and ever more mechanisms for subjugation. The response to the disenchantment produced by the Fox government must be an intensification of revolutionary struggle. Meanwhile there is the bourgeoisie’s back-up option of the popular front constructed around the PRD from 1988 on. In the mid-’80s, the debt crisis caused a drastic fall in the living standards of the working people, while pauperizing large sectors of the urban and rural petty bourgeoisie. Following a wave of workers strikes (Cananea miners, Sicartsa steel workers, Volkswagen, Ford), student and teacher protests (the anti-tuition struggle at UNAM in 1986-87, the CNTE [National Educational Workers Coordinating Committee] strike of 1989), and unrest in the countryside culminating in the Zapatista Indian uprising of 1994, the Mexican bourgeoisie urgently needed a fireman to extinguish potentially explosive social struggles. From the moment it appeared on the scene, the PRD has been nothing but an updated version of the PRI. Founded by former members of that party, together with a series of groups belonging to the “socialist left” (i.e., dyed-in-the-wool reformists), the PRD systematically sought to grab the lead of any social movement that threatened to go beyond bourgeois limits. The intention was to channel struggles towards “peacefully” dissolving into the bourgeois parliament. After more than a decade of leading the struggles of the exploited and oppressed to defeat, the popular front became increasingly unpopular among those who had been its base. The UNAM strike of 1999-2000 was a turning point, as tens of thousands of students refused to sell out the strike, in what had been an indisputable bastion of the PRD, contrary to what PRD supporters at the university tried to do in their zeal to protect Cárdenas’ presidential candidacy of in July 2000. Today, following Fox’s attacks on López Obrador, a good part of the population has been outraged by the deceitful use of the bourgeoisie’s own rules. The “silent demonstration” of April 24 in the Zócalo brought out 1,200,000 people, according to Federal District government figures, making it the largest political mobilization in Mexican history. Although some bourgeois media insist on making López Obrador out to be some kind of irresponsible “radical,” the truth is that he is a classic bourgeois-nationalist politician who reactivated the Cárdenas popular front. His list of do’s and don’ts for the “movement of peaceful resistance” against the lifting of immunity stresses that there must be no “blocking or occupying of public or private facilities.” Using the typical empty jargon of populism, he is seeking to carry out pressure politics with the permission of the national bourgeoisie and its imperialist masters. And that is just what has happened. With his mammoth peaceful mobilizations of April 7 and 24, Andrés Manuel López Obrador is showing how he can keep social mobilizations in check. He can also count on the support of the “independent” trade unions, whose bureaucratic leaderships are joining the recently revived popular front with undisguised enthusiasm. The leadership of the Mexican Electrical Workers Union (SME) announced that it will include “the issue of López Obrador in the demands for May Day,” while 40 other unions announced that they would hold meetings throughout the country on May 3 to 11 “in order to express their rejection of the lifting of Andrés Manuel López Obrador’s immunity, in defense of democratic life and against the privatizations the government is attempting to impose” (La Jornada, 24 April). The “independent” union bureaucrats are careful to say that they don’t necessarily give “political support” to López Obrador, but are only mobilizing in defense of “democracy.” That same day, a series of “union, peasant, civil, student and feminist organizations, along with artists and intellectuals” were calling to “form a common front against imposition” (of the president by the PAN and PRI). The organizations involved “made clear that the intention is not to push the presidential candidacy of López Obrador,” but instead to act in “defense of democracy and political freedoms” ... and to propose “solutions for the main problems facing the nation.” This is a classical popular front, which like any class-collaborationist political alliance is based on a program of the lowest common denominator: the supposed defense of democracy, justice, liberty and other bourgeois lies. As Leon Trotsky wrote on the eve of the imperialist Second World War, “in the colonial and semi-colonial countries – not only in China and India, but in Latin America – the fraud of the ‘People’s Fronts’ still continues to paralyze the working masses, converting them into cannon fodder for the ‘progressive’ bourgeoisie” (“Manifesto of the Fourth International on the Imperialist War and the Proletarian World Revolution” [May 1940], in Writings of Leon Trotsky [1939-40]). This argument, which sums up the approach of many other reformists, seeks to put a tiny fig leaf over what is, in fact, political support to López Obrador and the popular front around the bourgeois PRD. In order to justify their shameless defense of such an anti-democratic institution as executive immunity, these leftist groups are obliged to present their stand as if they were essentially defending the democratic right to run in the elections. But here a little problem arises, that López Obrador isn’t even the candidate of his party. The fact is that AMLO has not been excluded from the ballot, and what he is doing at present is mounting an election campaign on the basis of struggle against the desafuero, drawing in a series of opportunist left organizations that are incapable of resisting the pressure of 1.2 million people in the streets. So now the LTS can breathe a sigh of relief and assume the traditional position of the Morenoites, of swimming with the current of every petty-bourgeois or bourgeois movement. For them, this is nothing new. What they have always wanted is a more combative popular front. Following the electoral fraud of 1988, both sides of the Morenoite movement, which had only recently split, called for a general strike to impose Cuauhtémoc Cárdenas as president. One of the two Morenoite wings even urged the candidate to call the strike. But Cárdenas, with the decorum of the proper bourgeois that he is and his long experience as a PRI politician, declined the temptation and in fact demobilized the cardenista masses, just as López Obrador is promising to do today. Another outfit which outrageously claims to represent Trotskyism, but in reality only distorts it, is the Militante group, which has been very active in the demonstrations against the lifting of López Obrador’s immunity. “If there is desafuero, there will be revolution!” it stridently proclaimed in its newspaper (Militante, 2 April). So from the Morenoite call for a general strike we have gone on to a call for revolution ... in favor of a bourgeois candidate, using the excuse of “resisting” electoral fraud more than a year before the election! Militante has the nerve to call itself the “Marxist tendency” of the PRD, a capitalist party, thereby contradicting the most basic principal of Marxist politics: the class independence of the proletariat with respect to all the bourgeois parties. If the Morenoites specialize in tailing after every mass movement, from Peronism to the Russian counterrevolution led by Yeltsin, Militante current with its policy of “deep entrism” prefers to disguise itself completely and adopt the posture of “consistent” PRDers. Their own experience ought to teach them that the government of AMLO “is against the workers,” but we’re not going to hold our breath until they learn this ABC of Marxism. To be sure, in the same article Militante refers to the 60,000 (!) members of the Bank and Industrial Police as “workers in uniform.” These dupes don’t recognize the class character of their party, nor of the armed fist of the bourgeoisie. Generations of workers have received valuable lessons from the experience of repression (the “university of hard knocks”) about the nature of the capitalist state. But it seems that these PRD “Marxists,” who love AMLO and are crazy for Hugo Chávez, must be really slow learners ... or they just don’t want to accept this lesson of the class struggle. This wasn’t just a “difference of analysis,” as some members of the ICL later tried to claim in order to minimize it, but rather a fundamental programmatic question. The ICL’s revisionism on the popular front opened the way for a whole series of new and shameful political revisions. It discovered that in Mexico there were still feudal remnants, only to later discover that this “discovery” was false and anti-Marxist. Not accidentally, the thesis of “semi-feudalism” was the favorite justification of the Stalinists for their popular-front alliances with “democratic,” “progressive” and even “anti-imperialist” sectors of the national bourgeoisies of the colonial countries. This was followed by the claim that the corporatist “unions” in Mexico – mechanisms for the direct subjugation of the working class by the capitalist state, who organize squads of strikebreakers and are responsible for the assassination of hundreds of working-class fighters – are supposedly part of the workers movement. As we pointed out at the time, the GEM didn’t want to recognize the popular front in Mexico because it didn’t want to combat it. Now we have the proof. The ICL and the GEM have hitched their wagon as the caboose onto the popular front train. Workers Vanguard (No. 846, 15 April), the newspaper of the Spartacist League/U.S., the main section of the ICL, has published on its front page an article titled, “Mexico: Down with Fox’s Attack on Mayor López Obrador!” As a subtitle it adds: “Break with the PRD! For the Political Independence of the Working Class!” This whispered aside, stage-left only serves as a fig leaf, showing that their entry into the constellation of the popular front is fully conscious and shameful. Taking sides for López Obrador against Fox’s attack, no matter what provisos are tacked on, is giving him political support. Think of parallel cases: “Down with the Republican Attack on President Clinton!” during the impeachment proceedings, for example. Or, “Down with Bush’s Attack On Gore!” following the 2000 elections, when the U.S. presidency was decided by a right-wing Supreme Court. No matter how many times one might say “Break with the Democratic Party!” this would indisputably amount to political support to a section of the bourgeoisie. We repeat that executive privilege, whether for the head of the Mexico City government or the president of the republic, granting immunity against prosecution, is an anti-democratic measure, and that until now López Obrador’s right to present his candidacy has not been denied. To claim otherwise is to jump feet first into the electoral schemes of the PRD, which attacks the desafuero in order to broaden political support for the popular front. The popular front makes it utterly clear that it is seeking the support of people who say they are not going to vote for López Obrador. Participating in events against the desafuero “does not imply support to the candidacy (for the presidency) of Andrés Manuel López Obrrador nor the PRD,” says the SME (electrical workers union), using the same justification as the GEM. The latter denied the very existence of a Cárdenas popular front, only to now become a sputnik (fellow traveler) of the López Obrador popular front. Don’t forget that when the POUM (Workers Party of Marxist Unification) entered the orbit of the Spanish People’s Front in the 1930s, it began its capitulation with the excuse that it was only fighting to free jailed strikers from the Asturian miners strike of 1934, that it supposedly did not agree with the People’s Front program, etc. When the ICL today says it is defending democratic rights by supporting legal immunity for López Obrador, when it claims that the imperialists favor Fox over AMLO, they are repeating the electoral propaganda of the PRD and joining in its campaign. And when they claim there has been a qualitative leap backwards in the consciousness of the working class, what they’re really talking about is the pronounced rightward evolution of their own consciousness. Break with the Popular Front! Forge a Revolutionary Workers Party! 1 During the 71 years of its unbroken rule, the Institutional Revolutionary Party and its predecessors (PRM, PNR) ran what was in effect a one-party capitalist state, dubbed the PRI-government, in which the institutions of the party and the government were interchangeable. 2 The PRI-government maintained a corporatist regime, in which all sectors of society were organized under direct government control. Workers, peasants, students, housewives, musicians, architects, teachers, street vendors, military officers, etc., were all compulsorily enrolled in corresponding PRI organizations. The corporatist Mexican “unions” – rather than being workers’ organizations, albeit with sellout pro-capitalist misleaders, as is the case in most of the capitalist world – were actual mechanisms of employer and state control. In exchange for this rigid control, the CTM, CT and other corporatist federations provided a degree of social benefits, which recent governments of both the PRI and PAN have increasingly eliminated.